This workbook is a companion book to Residential Design Using Chief Architect X6. 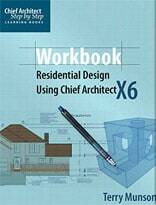 This workbook is a companion book to Residential Design Using Chief Architect X6. It enhances the tutorials in the main book by providing additional exercises and projects. It is designed and written so that the reader can practice and test their skills in the commands and concepts covered in the corresponding chapter of the main text. New tools and concepts are also included in this one of a kind workbook.